For Thanksgiving I made 7 pounds of Instant Pot Garlic Mashed Potatoes for our company meal. We really didn’t have much leftover. Everyone seems to love mashed potatoes and gravy – including me. With my Breville Smart Oven Air fryer I am always thinking about what I can air fry sans oil to transform our plant based favorites into something even more extraordinary! So of course I took those leftover garlic mashed potatoes and rolled them into balls and air fried them. Holy Moly are they ever tasty. To guild the lily just a bit I made a batch of Donna’s Vegan Cheeze Sauce to dip them in – perfection! I had a plate of these for lunch – yes I did! These would be excellent as an appetizer for Christmas or New Years Eve. It’s a fun finger food that just about everyone would love. Who doesn’t like mashed potatoes? Okay there is probably someone out there who doesn’t like them but that’s okay because I’ll eat the ones they don’t want! Shown with Donna’s Vegan Cheeze Sauce for dipping. Garlic Mashed Potato Stuffed Baby Bella’s. Since the Garlic Mashed Potatoes were so amazing air fried I decided to stuff some baby bella mushrooms. These are also pretty amazing. Just de-stem and clean out the mushrooms like I showed you how to do in the large Garlic Mashed Stuffed Portobella Mushroom video and blog post. Fill the mushroom cap with potatoes and oven fry at 400 degrees 12-15 minutes and you have a scrumptious little bite of heaven. They make a lovely appetizer or side dish. They are so darn cute too! I topped some of them with Donna’s Cheeze Sauce and popped them back in the air fryer for a minute or two just to heat up the cheeze a bit. Garnish with some chives and you are good to munch! This is a meal all on it’s own! Some Garlic Mashed Potato Balls and some Stuffed Baby Bella’s with a little Vegan Cheeze Sauce. This will be a regular menu item for us with left over Garlic Mashed Potatoes. Easy and delicious – just what I like. I have made these twice already. Preheat air fryer to 425 degrees for the potato balls. Preheat to 400 degrees for the stuffed baby bella mushrooms. 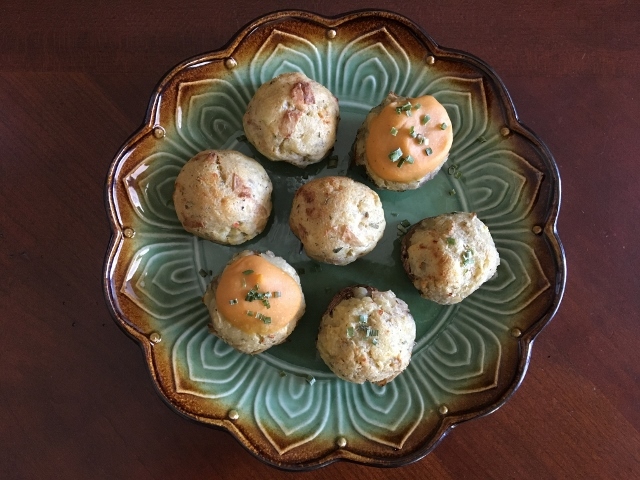 For Potato Balls: Using a scoop of chilled potatoes one at a time roll them and place on your air fryer rack. Air fry for 20-15 minutes or until nicely browned. The time will vary depending on how large you make them and how moist the potatoes are. For Baby Bella’s: Remove the stem from the mushroom and using a small spoon clean out the gills. Using a small scoop of mashed potatoes gently press it down onto the mushroom cap so it won’t fall off during cooking. Place on frying rack and air fry for 12-15 minutes until the potatoes are getting slightly brown and the mushroom is cooked. If desired top with some of the cheeze sauce and put back in the air fryer to warm the cheeze slightly. Serving suggestion; Garnish with fresh or dried chives or sliced green onions. 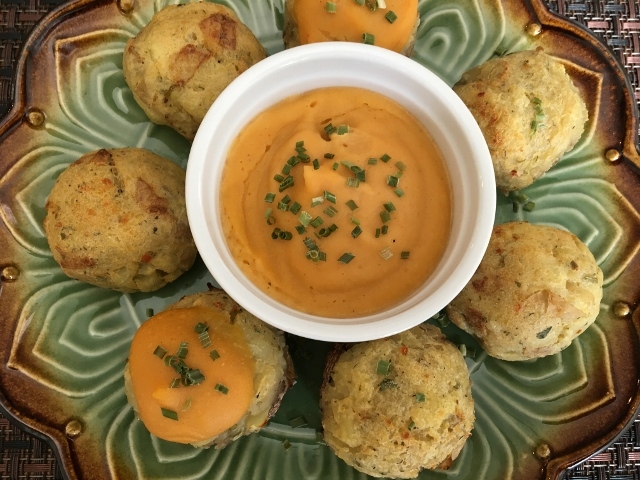 Serve with Donna’s Vegan Cheeze Sauce for dipping or spread some cheeze sauce on top and enjoy. I had to share this photo of our Thanksgiving Turkey that our dear friend Annie who happens to be our daughter Katy’s sister-in-law made and brought to our dinner. Isn’t this a work of art? It was also quite delicious. 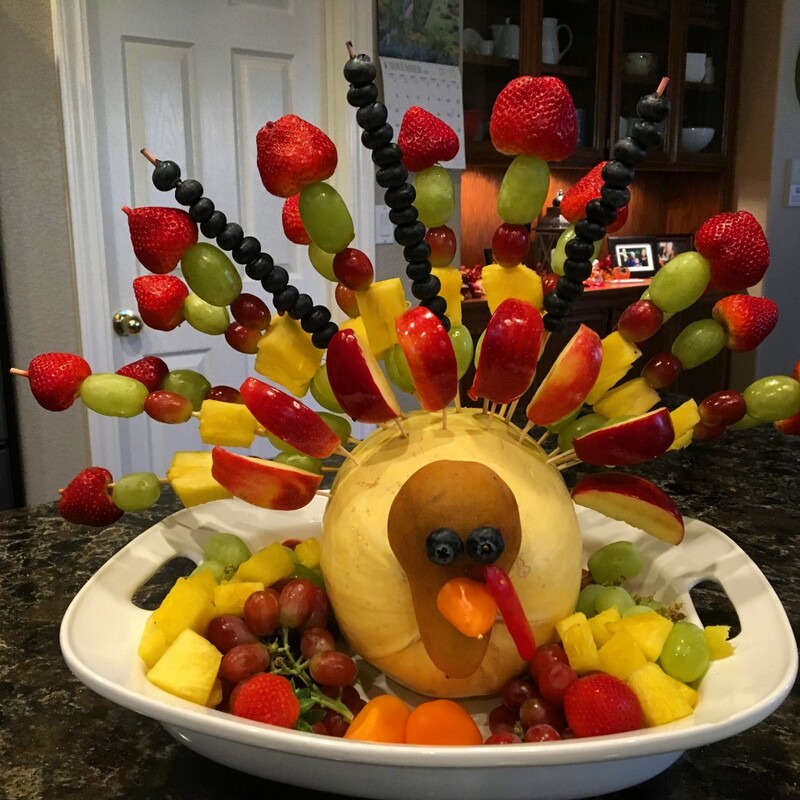 What a fun fruit plate to have for the holidays! I hope everyone had a nice Thanksgiving holiday. We had a lovely day with family. We hosted this year and spent the day with our son-in-laws family. We had a spectacular meal followed by a walk in nature. In the afternoon we enjoyed beautiful piano playing by Junior, Pamela and hubby Tom. We took awesome photos in the backyard among the beautiful fall leaves as a backdrop. Afternoon tea, coffee and desserts were a fun way to end to the day. We are truly blessed to have this loving extended family. Now its time to start planning for and decorating for Christmas! Previous Post: « Fall Pudding Just In Time For The Holidays! Great post, Tami! I’ve made your garlic mashed potatoes a few times now, and brought them to my family Thanksgiving celebration – they were a big hit! 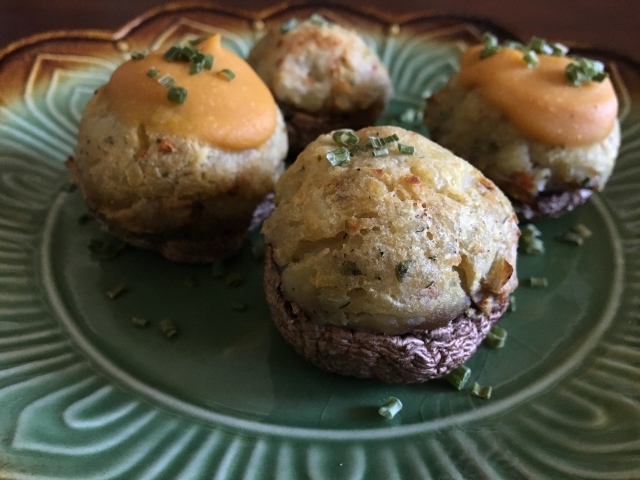 I’ve made stuffed mushrooms with them too. They’re just delicious! I’ll definitely try these potato puffs and cheese sauce as well. Thanks for the great idea! I am so glad you are!enjoying the mashed potatoes! They are so good stuffed into mushrooms. On Thanksgiving Day I oven roasted heads of garlic in the oven and used those in the mashed potatoes and that was awesome too! Happy Holiday season to you Colleen. Hi Tami, great blog! I am trying to decide whether or not to get the Breville. I have a convection oven and got some convection oven baskets to go in it. It makes potatoes nice and crispy. Would you still recommend getting one? I also have a double oven and one of them is a convection oven but I still like the Breville better for air frying. It heats up in just a few minutes, doesn’t heat up my kitchen – a nice benefit in summer here in CA. Plus it replaced our toaster, I can bake muffins in it and it can handle a 9 x 13 casserole dish. We cook all kinds of veggies in the air fryer and love the results. If fries is mainly what you like crispy and your are happy with your results with the baskets you have maybe you don’t need to get an Air Fryer. I think since the Breville has a dedicated space on my counter it gets used all the time verses one that I would have to put away and get out every time I want to use it. I hope this was some what helpful.